It's a sad commentary on our society that we need books that tell us how to protect ourselves from the police. But with the number of drug arrests each year climbing inexorably toward the two million mark, and with drug prohibition being, in our view, morally indefensible, those of us who use illicit substances (or have friends or loved ones that do) need all the protection we can get. This book will help drug users avoid arrest. I won't be shy: I think this is a good thing. Call it applying the principles of harm reduction to the US criminal justice system. While we acknowledge the possible harms drug users can incur to themselves or inflict upon others, we think the harms of being arrested, and quite possibly imprisoned, far exceed those of drug use. People who harm others can be punished under other kinds of laws than those that criminalize drugs. Anything that can throw some sand in the gears of the drug war machine is something to cheer. "Beat the Heat" throws sand in the gears of the drug war machine. It does so by teaching its readers how to exercise their basic constitutional rights. That's another sad commentary in itself. We have a prohibitionist drug policy that relies on citizens knowingly or unknowingly waiving their rights in the face of intimidating uniformed men with guns. After all, it's not like drug use or sales is a crime where there is a complaining victim. Nor do drug users or sellers normally flaunt their contraband items. The only way many drug arrests are made is by people letting the police browbeat them into doing something stupid -- like admitting they smoke pot or allowing the police to search their vehicle when they know there are illicit items within. Katya Komisaruk shows you how to exercise your rights in an easy-to-read, down-to-earth fashion, complete with illustrated scenarios where she shows you what you did wrong and what to do instead. It's not rocket science: Never talk to the police, she advises, and never consent to a search. You've got nothing to gain and plenty to lose. The police aren't talking to you to make idle chit-chat. They are investigating, looking for possible crimes, and the more you open your mouth, the greater the chances of ending up in jail. In response to police requests to talk, Komisaruk recommends this phrase: "Am I free to go?" If the answer is "yes," then go. If the answer is "no," you are already being detained or arrested. The correct answer to all further inquiries from police is: "I'm going to remain silent. I'd like to see a lawyer." And when it comes to requests to search you, your home, or your vehicle, the answer is always: "I do not consent to a search." These are basic constitutional rights, and it seems simple to exercise them. But police are experts in getting people to waive their rights. 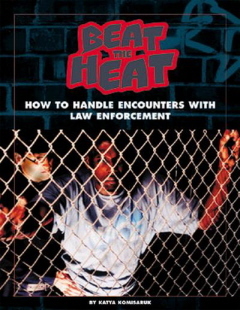 A valuable portion of "Beat the Heat" is devoted to explaining just how police get people to waive their rights -- intimidation, false friendliness, lies -- and how to avoid falling into those traps. But "Beat the Heat" is much more than just how not to get busted. It's also a primer for those who have been arrested and are now facing the tender mercies of the criminal justice system. Komarisuk covers it all, from getting out on bail to working with your lawyer to what to do if all else has failed and you're headed for prison. There's also a chapter on how to witness and accurately report police misconduct, as well as chapters on the legal rights of minors and non-citizens. Don't get me wrong: "Beat the Heat" is not written as a book to help drug users stay out of jail. Nor is it a diatribe against the drug war. It merely teaches people how to protect themselves from unnecessary arrest by knowing their rights and how to effectively exercise them. And that makes it a book that helps drug users stay out of jail. I'm all for that. There are 20 million drug users abroad in the land today. If you are one or know one, you need to get this book. Komisaruk will make it easy for you to understand what you need to do to protect yourself.